Shout! Factory TV Announces SUPER SENTAI SPECTACULAR on January 23rd! Before Saban’s Mighty Morphin Power Rangers, There Was Super Sentai! When the sinister witch Bandora is released from her prison after 170 million years, five warriors from an ancient time are woken from suspended animation to once again defend Earth from Bandora and her evil horde. Armed with enchanted weapons and giant robotic deities known as the Guardian Beasts, it’s up to these warriors to defeat Bandora and her monsters before she can exact revenge upon the Earth for the death of her son. This January, see where the worldwide phenomenon began with Shout! Factory TV’s Super Sentai Spectacular! Join us for a three-hour live streaming event hosted by Tokusatsu expert August Ragone as the first seven episodes of Super Sentai Zyuranger blast onto the screen on Saturday, January 23 at 9.a.m. (PST) at www.shoutfactorytv.com. The marathon will be streaming episodes of the original Japanese series that inspired the Power Rangers franchise, presented in Japanese with English subtitles. After fans have watched the first episodes here, all 50 episodes of Super Sentai Zyuranger will be available on Shout! Factory TV for evergreen streaming following the marathon. 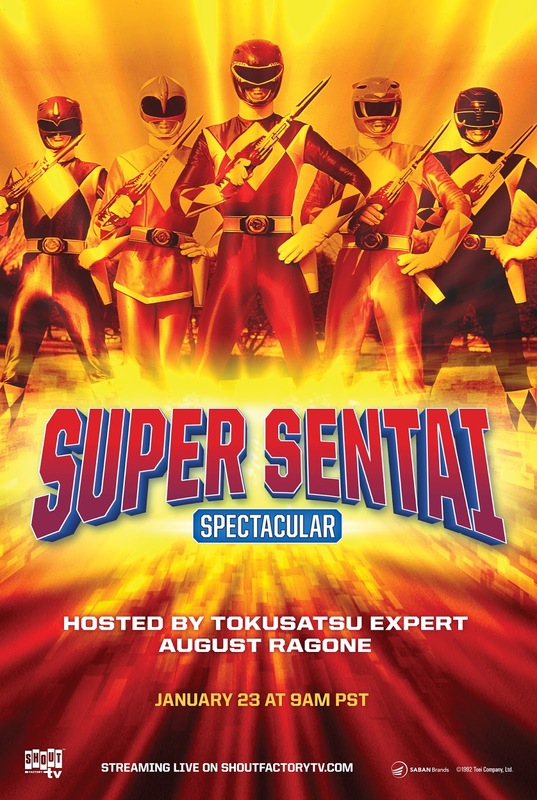 The Super Sentai Spectacular comes complete with original introductions by renowned Tokusatsu authority August Ragone, commenting on the impact of this landmark series. A two-time Rondo Award-winning author of Eiji Tsuburaya: Master of Monsters, Ragone has commented on Japanese film and popular culture on radio, television, in print, online, and at events for more than three decades. Fans of Power Rangers and classic Japanese TV won’t want to miss these episodes streaming free! Join the conversation with host August Ragone and other Super Sentai fans with the hashtag #Zyuranger while you watch. 11:50 a.m. – Super Sentai Zyuranger: I Can See! I Can See! Shout! Factory TV’s Super Sentai Spectacular will be streaming from 9 a.m. to noon (PST) on Saturday January 23rd at shoutfactorytv.com/ and on Pluto TV, CH 515. For mobile, tablet and connected TV devices the marathon is accessible via the Pluto TV app. The marathon is also available via Pluto TV in the living room (Roku, Amazon’s Fire TV and Fire TV Stick, Android TV devices, Chromecast and Apple Airplay), on the go (apps for iOS, Android and Amazon) and at your fingertips on PC’s, Mac’s or on the web. FOG! Chats With EXHUMED Director Richard Griffin and Screenwriter Guy Benoit!